"Did they tell you you would come undone when you try to touch the sun?" I'm a father, a husband, a writer, and a teacher. I'm represented by Cameron McClure of the Donald Maass Literary Agency. It's not goodbye . . .
Come to My New Blog! If you followed a link here from a comment I made on somebody's google blog, I would love to have you visit my blog, but this is no longer it. While I may occasionally post things here again once in a long while, virtually all my content will be at www.labyrinthrat.com from here on out. If you were curious enough to come this far, why not give me one more click? Way back on March 14th of 2008, I set out to document my renewed commitment to a dream that kept popping up every few years, every time I thought I'd successfully smothered it and locked it into a trunk in my attic: I wanted to be a writer. I saw some folks around me have some success, and I became convinced that the only thing holding me back was myself--that if I let my obsession thrive, my writing would improve and I would find that selling your writing was not some pie-in-the-sky thing that only happened to those strangers whose names line the shelves in Barnes and Noble. It was actually a few months before March (*gasp* Pi Day!) when I got serious, but by March I was starting to see results, and starting to believe I was on the right track. I started to believe I was on the road to somewhere, and so I set out to document my observations. Now I still haven't reached my writing goals. And when I do succeed in convincing somebody to buy my words, I know I'll have new goals in my sites. But I've been thinking for some time just the same that it was time for a new kind of web presence. This blog was, as I noted in that first post, intended to be a diary of sorts, that other people were welcome to read, but a diary specifically of my writing journey. The journey continues, but I've begun to want other things out of a website. I knew all along that this blog was likely of little interest to anybody but me, and I said right at the beginning that I wasn't looking to create an every-day what's-going-on-in-my-life kind of blog. In the time that's passed, though, I've begun to interact more and more online, commenting on other people's blogs, having a ton of fun at facebook, and lastly really getting into twitter. There are real communities out there: communities of writers, of readers, and of all around cool people. And I'm finding that after three-plus years, I want to broaden my scope. On the other hand, I don't want to lose the period in my growth that this blog was always intended to chronicle, and so I've decided that the best thing to do is keep this blog for as long as Blogger/Google maintains the space, but develop a new website for most of my future online interaction. I've spend the last couple of days tinkering with WordPress and I'm finally ready to start pointing people to that new page: labyrinthrat.com. If you're one of the half-dozen or so people who seem to have gotten something out of reading my blog over the last few years, I hope you'll follow me on my new one. Since it's going to be larger in scope, I hope to have a lot more to share with people over there. If I currently trade links with you, I've gone ahead and linked your webpage/blog on the new site. Those of you who link to me, if you'd update your links I'd be grateful. I'm not entirely done with this blog. There are some milestones I haven't reached yet, and when I do, those observations really belong here. But there won't be very many more posts here in the future. This is not goodbye, but it is a transition. I can't bury this deep within the post like I'm typically inclined to, because I'm just too excited: I have an agent!! I actually got two offers of representation, the first of which came on June 10th, so I've been keeping this under my hat until I'm fit to burst. The first agent tried to call me on the last teacher work day before summer vacation. I had left my desk to run some errands--drop off paperwork and get signatures, and I very consciously left my phone on my desk, because what could I possibly need it for, right? When I came back, I saw I had missed a call . . . hm, New York/New Jersey area code . . . as I played the voice mail, it gradually dawned on me that I was receiving The Call. I'm surprised I didn't kick my desk over in my excitement. I let out a whoop that neighboring teachers could hear in their classrooms--and let me assure you, I am not generally given to whooping. That call came from an agent I had met in person at Backspace--so you see? Go to Backspace!--who works at a fantastic house that is closed to queries unless they meet you at a conference--you see? Go to Backspace! This house was high on my list because they rep not only what I've written, but everything I could see myself possibly wanting to write some day, and because they had a fantastic reputation everywhere I looked. For the rest of the day, I was not fit to work at all--but I still had a deadline! I had to call Lisa to come over when she was done and help me, and while I got my grades turned in on time, I was about five minutes late turning in my keys and had to wait until Monday to turn them in and get that last paycheck of the year. So I went home and informed the other agents looking at my work that I had an offer now, and stood back and watched the flurry of activity. I did have one vaguely snarky reply, slapping my wrists for my presumption in nudging, but otherwise everybody was nice and enthusiastic. Even the agents who stepped aside did so with very kind words for my writing and my story, and a few said they simply didn't have time to get back to me within the time frame that I intended to get back to the offering agent. Within a week I had a second offer! Yay! Proof the first agent wasn't high on crack when she called me! I always thought having any offer at all was a dream come true, but that having more than one--having a choice of agents--must just be sitting on cloud nine. I confess I wasn't terribly sympathetic when my wife went through this several months before. Now I know. You may not, though, and if not then you probably won't get how much anxiety this caused in me. For one thing, with choice comes the possibility of regret. Would I make the right choice? Almost more importantly, in this case, is I really have little stomach for letting people down. Here are two professionals who both loved my novel enough to offer to invest their time and resources into helping it see the light of day! Before last week I could count on one hand the number of people who'd read the full manuscript of Vanishing Act. To have somebody read it and love it and tell me what they loved about it . . . I just can't tell you what it meant to me. I wanted to hug them both; I wanted to give them both whatever they wanted. Instead, I had to tell one of them that she wasn't my choice. It was probably harder on me than it was on her. Agents know this is a business, and they know some other book'll come along that they'll love and want to sell. I can't help but feel like a bit of a jerk, though, even though rationally I know this is just how it goes. Choose I did, though. I can't imagine anybody reading this doesn't already know from facebook or twitter or just from hearing me whooping all the way cross country, but I am now represented by Cameron McClure of the Donald Maass Literary Agency! :) I chose Cameron for a variety of reasons. Cameron had some ideas on how I could make my novel stronger that really resonated with me. As I read her e-mail, I found myself nodding my head and saying, Yes! That would totally make my book better! Also, I like the idea of being agent-cousins with my wife, who is also represented by DMLA. I don't know if most husbands and wives who write are at the same agency or at different ones--the only pair I know offhand is Scott Westerfeld and Justine Larbalestier, who are both represented by the Jill Grinberg agency--but it just seems cool to me to keep it in-house, so to speak. And heck, DMLA is also an amazing agency with a fantastic reputation--an agency that represents a boatload of my favorite speculative fiction writers. I'm thrilled to be agent cousins with so many amazing writers! As I mentioned a couple posts back, I had the opportunity to attend the Backspace Writers Conference at the end of May. Let me come right out and say that this experience was everything I hoped it would be. I met a lot of awesome aspiring writers, pitched my book to some great agents, and, as much as anything else, walked away with a satisfying feeling of validation. It really is energizing to spend a few days with writers--aspiring and/or published. In my daily life, so many people really just don't get what this is all about. They ask if I'm "still writing that book" or they don't get why my book hasn't come out yet. Or they suggest I get advice from the person who paid to print up her students' stories and thus calls herself, alternately, an "editor" and an "author." Or they smile and nod but clearly look at this as some foolish pipe dream that any sane person would have given up on by now. "Save me an autographed copy! Get me front row tickets to the movie premiere!" When I talk about looking for an agent, most people don't get what that's about. They think you just go out and hire an agent, or that an agent is some vaguely suspicious thing--"This person gets a percentage? For doing what?" If you do sign with an agent--like my wife did, with Amy Boggs of the Donald Maass agency--many people outside the field don't recognize that as a huge step toward reaching your goal. The folks you meet at Backspace all get it, though. We all want the same things, and we're all comparing notes and sharing what we've learned. It's so nice to talk about these things and not have to first explain and second have it all sail right over someone's head anyway. (And not feel like people are rolling their eyes, either.) And the mix of people there--besides the aspiring writers there are the agents, the editors, and the published writers. I virtually never felt like I wasn't taken seriously by the pros. I got to hang out by the bar with professionals who understood my dream because it was their dream too, and not so long ago. It's always hard to come down from that high--from feeling like a writer, dammit for several days in a row. It's a challenge whenever I attend a writers' conference (I can't help but feel like there should be an apostrophe after that S) or, heck, after my crit group meetings. It's not about not liking my day job--I do. But this is a passion too, and it's one that usually has to be fed in stolen moments. Stolen from grading and lesson planning, stolen from cleaning the house, stolen from having a hobby or watching television. Going to Backspace was like mainlining that feeling that I normally only get in small doses. And I hope it doesn't sound too arrogant to say this, but this trip was also a positive for me because it made me feel like I had the goods for real. Obviously winning a scholarship helped in that department, but just getting the chance to exchange ideas, and to have people look at my work and tell me what was good and what could stand to be improved, all made me feel like it wasn't some pipe dream after all. That's not a competitive thing--writing isn't a zero-sum game, and my success doesn't come at the expense of someone else's. There was a time when I kept writing once in a while because I couldn't seem to stop for long, but when I had pretty much concluded that I would never be published. That time couldn't be further away now. I'll end with a pitch of my own, for any novelist who's serious about taking the next step. Go to Backspace. Get as ready as you can first, learn as much as you can, get as polished as you can. It's a good experience and a good education either way, but you'd be wise to prepare yourself to get the most from it. And save up, obviously. But even if you have to pay for it yourself, this conference is worth every penny. My only caveat is, do your damnedest to have a product worth selling. A good manuscript, a polished log line, and if you're shy, whatever source of personal courage you have to find to enable you to walk right up to people and start a conversation about your novel. I've seen this experience up close twice now, once when Lisa attended and now for myself, and no other conference I've been to compares. Anyway, one thing that struck me as I read it was how vivid all the characters are, including the secondary ones. There are two main POV characters, but countless others that we meet throughout the book, including some that only live for a few chapters, and they all feel like real people, with real foibles and distinct personalities. Now more often than not stories drawn from RPG's are denigrated, but I think that's more about when people take their generic D&D campaigns and attempt to turn them into generic, cliché pseudo-feudal fantasies, complete with elves and dwarves. This is nothing like that. Franck had a sweeping, cinematic background conflict that was as well-thought-out as any novel before the RPG ever got started, as Abraham notes above. I was one of the many people fortunate enough to play in Ty's rich, rich universe over the years, which is how I came to get an ARC of this six months early. 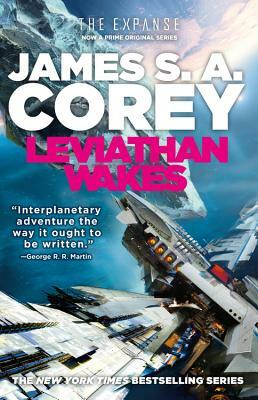 I only came in near the end, and my character does not appear (by name, anyway) in Leviathan Wakes. But I spent several months traipsing around the belt with Captain James Holden, and I'll tell you what--he feels more real to me than some people I know. Each of us created a character for the campaign, rolling up stats and then inventing a backstory that would put them in the path of the action. We then introduced our characters to each other by writing a vignette starring our character, set some time before our character entered the events of the campaign. The vast majority of the players involved were writers, with varying degrees of publication success, so we all took our characterization seriously, and we each set out to create just one person that would ring true. There wasn't any sense that this or that character was "the girlfriend" or "the sidekick" or "the token" or any of those ruts we can easily fall into as writers when we're creating a whole cast of characters at once, and when we view those characters as a means to an end. In our case as players, the characters were the end. Which brings me, finally, to my point on characterization. I've tried character sheets. I've tried interviewing my characters. I've tried writing up biographies. I've tried other people's worksheets with questions about a character's goal or what a character learns. Hopefully I haven't made to bad a botch of anything, but I haven't found any of these to be especially useful to me. Characters come alive or not, but months later I find whatever details I wrote down about these characters in some file and realize I never gave this or that trait a second thought. On the other hand, Eddie Suarez, the radical guerrilla liberation theologian I made up for Ty's game, still feels very real to me. I'm confident I could slip right back into his character and write new scenes from his point of view, and they would feel right. So I'm going to try and duplicate the process I followed with Eddie with my new project. Not by playing an RPG. I think stories that are epic in scale lend themselves to that, but my stories tend to be much more . . . intimate. But in addition to coming up with background sketches for my characters, focusing on the roots of their personalities, I'm going to write little vignettes for each of the major ones from their point of view (whether it's in first or tight third). In Vanishing Act, I never wrote anything where the point of view character was Danny (the antagonist), or Paul (one of the good guys), or Steven (Chris's father). I hope spending some time in those other character's heads will help me make them more than just foils for the protagonist to play off of. Kind of like Method Acting for writers. Allergies have got me up a bit earlier than I'd prefer this morning, so it seems like a good time to get down to something I never quite seem to make it to on my priority list--this blog. Insert here the standard whinge about what a difficult school year this has been in terms of powers that be putting new requirements on our plate that weren't there before without relieving us of any of the old requirements. The smart course of action would be to figure out which of their directives I can get away with ignoring, but I'm too obsessive/compulsive to know how to do that, so instead I drive myself into the ground trying to do every single damn thing. I put in twelve+ hour days every single day, and that's no hyperbole. You'd think that would be enough to be ridiculously together and on top of everything, but really it's just barely enough to tread water. And the worst thing is most days I'm not sure anybody notices how much I'm doing at all. But enough whining about work--I want to talk about writing! I've actually done a pretty decent job of making time for writing in spite of the work madness. I've got a new idea for a YA fantasy novel fleshed out and hope to get a running start of several thousand words written before the summer begins. I wish I had a title for it, if for no other reason than so I could come up with a meaningful label for this post. My most exciting news right now is still about Vanishing Act, though: my query letter and opening pages won Janet Reid's Backspace Contest! My biggest frustration is how few people appreciate what a big deal that is, to me anyway. Lisa went to the Backspace Writers Conference in 2009 and it was an amazing experience. The chance to workshop your query and opening pages with scores of agents, in-depth and all in one venue, seems to work wonders for helping aspiring novelists master that step on the road to publication. I don't know if anybody's tried to collect data on what percent of their participants go on to secure representation and eventual publication, but, anecdotally, their numbers seem to be phenomenal. Indeed, Lisa arrived at Backspace unrepresented, but left with an offer from an agent. She's not the only one. The Backspace folks have already been in touch with me and they've already been unbelievably enthusiastic and generous. I've won other prizes before--vacations and such--where I felt on arrival that the attitude was, "You're already getting this for free, so don't expect any frills at all." Not so with the Backspace conference. They've made it clear to me that my prize includes any and all parts of the conference that I'm interested in, including the parts that would normally be an extra charge. They've also made me feel as welcome and as valued as any paying customer. It occurs to me that in all this gushing about the Backspace folks, I really ought to express more appreciation for the folks at Fine Print Lit and Nancy Coffey Lit & Media, not just for choosing me, but for holding this contest every year. I'm not certain who's picking up the tab for me to attend this conference, but we (teachers in my county) haven't had a cost of living increase to our salaries in three years, and now we have to deal in the coming years with attacks on our profession and our salaries from Republicans in our state legislature, and times have gotten increasingly tough for us as the years have passed. Every year it seems we tighten our belts a little more, and only occasionally do we look back in awe at just how much spending power we've lost, bit by little bit. Used to be we could go to the occasional writers' conference, or, hell, take a vacation or something. Used to be we could afford to buy tickets to Disney World right in our own backyard. Used to be we could eat out with some frequency. Now we cross our fingers that next year will still find us living in the same house. It's safe to say there is no way we could afford to send me to a $750-$800 conference (not counting airfare or hotel). This is an awesome opportunity that I would never have if not for this contest. Also? Janet Reid sounds totally nice on the phone, and not like a shark at all. I can't wait until the end of May! A few words of explanation: Veronica Roth is holding a contest for an ARC of her new book, Divergent, on her blog. You could get a second entry by posting a picture illustrating a difficult choice. Unfortunately for me, I just found out about it this morning, and I got this idea at 12:15, just minutes before the contest closed. 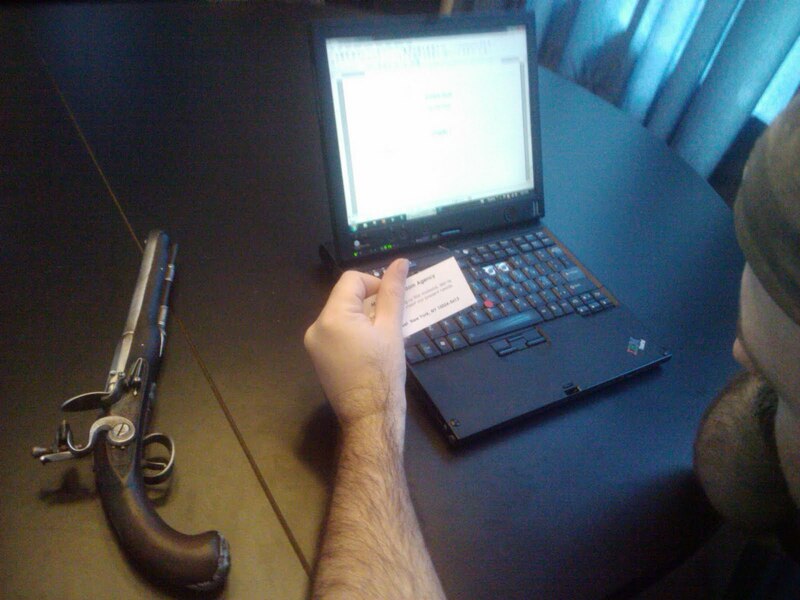 So the only camera I had handy was on my phone, the only prop gun I had handy was from Pirates of the Caribbean, and I'm not sure if you can tell that's one of those tiny rejection slips some agencies send out so they can get twenty rejections out of a single sheet of paper. I'm not sure if it comes across that the choice is between continuing to write and violent action, but that was the intent. As for me, things are going much better than this photo implies. I'm still a finalist in the contest-that-must-not-be-named, and while I'm receiving my fair share of rejections, I'm getting a respectable amount of not-rejections as well. I've been way too swamped at work to blog much, but I'll try to get back on it soon. I was reading a poem that I didn't quite get, but I could get some sense of the meaning and passion behind it, just out of reach, and it occurred to me that if some sort of mind reading were possible, this is what it would be like: Sometimes a message comes through loud and clear and you get it and can either agree or not, or you can at least appreciate it. And sometimes the set of experiences that you'd need for the thought to speak to you are just slightly skew of your own, and you get some vague impressions but at the end of it all you just can't say what it's about. And usually, even when the meaning is reasonably clear, it takes a little bit of intellectual work to unpack it all. I'm not claiming for a moment that this is an original thought, but when I approach it this way, even poetry I don't get provides me with a neat experience. This is a switch from my experience as a literature major in college and grad school. So much of my schooling focused on decoding poetry, as if we'd intercepted from the front--"If they be two, they are two so/As stiffe twin compasses are two"--"Roger that: the lovers are staying together BRRRSSSCHT!!!" "The white dove sails at dawn" "BRRRSSSCHT!!! Wait--what?!" If you decoded it the same as the professor did, you had succeeded. If you decoded it differently or not at all, you failed. And that's where my discomfort with poetry probably stems from: too much experience of failure. Who likes feeling inept so much? I've been stumbling across a lot of poetry lately. I suppose discovering Taylor Mali a few months ago reawakened my interest in the form. I don't ever find that I don't know what Mali is talking about. Maybe because he places an emphasis on accessibility, or maybe because, as a teacher, I share enough common background with him that I get what he's talking about. I'd like to go to a poetry slam sometime, ideally with someone who was into them and knowledgeable. I don't pretend for a moment that I could write anything worthwhile myself, but I'm just enjoying the opportunity to appreciate what others can do. It's a little bit of a relief, actually, to be able to come to art as a consumer only. I think I can maybe appreciate more purely when I'm not thinking about how I would like to do it myself. And yet . . . and yet part of me wishes I understood the medium better because I'd like to crystallize thought this way. I wrote crappy poetry as a teenager like every angsty, arty kid does. I don't mean that. I mean I wish I had some sense of how to write poetry that captures and evokes something without being self-conscious. Maybe I'd like to experience more poetry in the hopes of getting a sense of how this is done. Lord knows we don't need crappy teen poetry from nearly-forty-year-olds. "Love poem in the shape of a cochlear mechanism" by J. Mae Barizo (not a permalink, sorry). I found this poem while looking for more online poetry by Alexie. This poem actually prompted this post, largely because I don't get it. My uncle and aunt are deaf, so I have some passing awareness of what a Cochlear mechanism is and the pros and cons of restoring hearing this way. I feel like I can *almost* sense meaning here, but like I lack some experience that would tie it all together and make it understandable to me. This is what prompted the comparison to mind-reading without the background to make the thoughts intelligible. In the past, coming across a poem like this would make me feel inadequate, like maybe if I were smarter I would get it. This would be followed in short order by anger: This poet is obviously some pseudo-intellectual playing a masturbatory game by stringing together cryptic phrases so that a bunch of snobby elites would stand around and nod thoughtfully, with nobody daring to point out that the emperor has no clothes. Now I'm just appreciating the experience for its very alien-ness. "Narrative 5" by Paul Guest. Another look inside someone else's head. I like the images here, particularly that of the soaked book and the crude drawing of a bus. I feel like a lot of it sails over my head, but that's okay. I ran across his poem when I followed a link to his excellent rant about the idiocy of the new TSA screening procedures, and his uncomfortable experience with them. "Song for an Ancient City" and "To the River," by Amal El-Mohtar and Jessica Paige Wick, respectively. Elizabeth Bear linked to this page on Twitter, and possibly in her LiveJournal as well. She was linking to "Song for an Ancient City," but I actually found "To the River" more compelling. Later I read here that El-Mohtar wrote "Somg for an Ancient City" as a love song to Damascus and this seemed to emphasize my sense that my ability to "get" poetry depends on my ability to step at least partway into another's shoes*. I'm not going to feel embarrassed if what I took from "To the River" is something other than what Wick intended, or if I missed a world of nuance--because there's the flipside: that our experience of someone else's poetry is our own, neh? I guess the speaker is a ghost or possibly a vampire, but I keyed in on the images of stolen innocence: the ribbon, the knee-socks, the unmade bed. As an adult survivor, these images speak to me. There is a sense, to me anyway, that the speaker is now tempting new victims to the river, which is of course disturbing when I look at the poem in that light. But I focused instead on the confusion embodied in the lines "And I'm hideous and hair-thatched/because I must be trash/for him to throw me to the river/like a used cigarette." Who can't identify with being used and discarded? Anyway, I don't think I'm fully communicating how much this idea of poetry as imperfect mind-reading changes my appreciation of poetry, but to me it's kind of game changing. It goes beyond a throwaway metaphor. It basically empowers me to enjoy poetry without regard to whether I'm decoding it in the way the author intended, where before I could only enjoy it if it spoke to me perfectly. *Um, I totally intended to put a footnote here, but now I can't remember what it was. Damn.